LEWIS FREDERICK HOLL and his brother, George Holl, built many houses and commercial buildings in Camden in the late 19th and early 20th centuries. On April 8, 1876 Lewis Holl was appointed to the Camden Fire Department as an extra man with Engine Company 1. He resigned on November 21, 1876 and was replaced by Asa Borton. 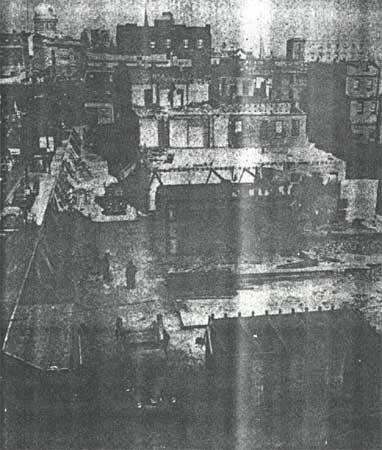 The 1878-1879 City Directory shows Lewis Holl at 305 Chestnut Street. The following year's directory has him at 317 Chestnut Street, where he stayed through 1885. 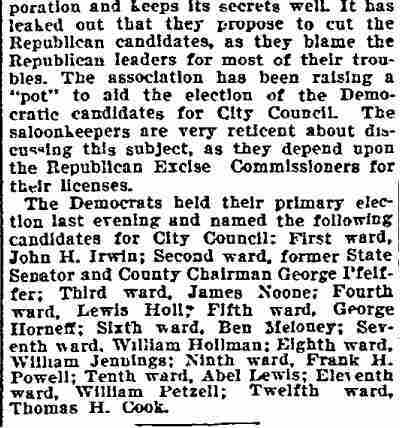 He served as a member of Camden's City Council, representing the Fifth Ward in 1881 and 1882. Among the builders of Camden are several who have erected five or six hundred houses each. The heaviest operators are undoubtedly Cohn & Roberts, Wilson Ernst, and George Holl. George Holl, who has been engaged in building for eighteen years, has erected from four to five hundred houses, principally in the central part of the city. 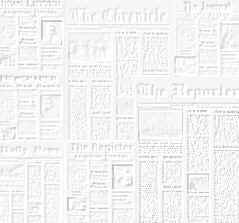 They are nearly all of what may be denominated the medium class, in size and pretensions. His brother, Lewis F. Holl, has built many houses in the lower part of town. The 1887-1888 directory for Camden shows Lewis Holl living with his wife Willimina and daughter Emma L. Holl at 328 Mount Vernon Street. Emma Holl also worked as a teacher. In April of 1887 a son was born, Arthur Henry Holl. George Holl at the corner of Broadway and Benson Street, and the directory for 1888-1889 has him at 310 Broadway. Lewis Holl & family stayed at 328 Mount Vernon Street into 1892. Around 1890 the Holl brothers erected twelve three-story business properties on the east side of Broadway between Mickle Street and Stevens Street. 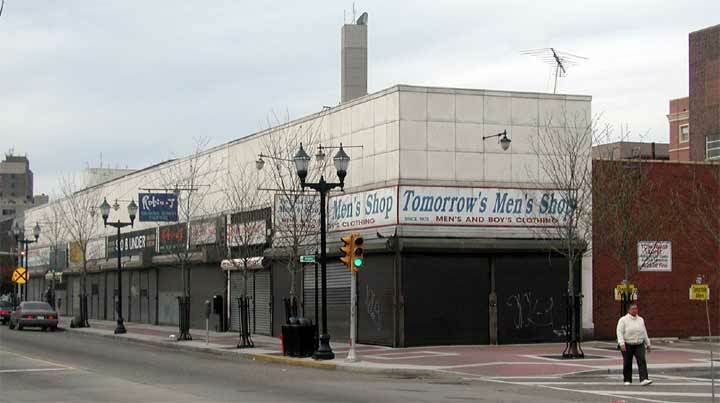 This block became known as the Holl block. The 1893-1894 City Directory shows the Lewis Holl family at 539 Berkley Street. Lewis Holl remained at that address until his passing on December 18, 1919. His brother, George Holl,had died on April 16, 1912. The brothers were buried in adjoining plots at Evergreen Cemetery in Camden, eventually joined by Lewis Holl's daughter Emma. 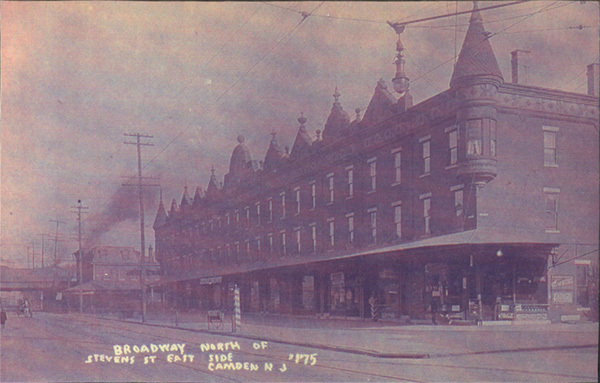 The properties on Broadway remained in the family for a time, but eventually found their way into Orphans Court, and were sold at auction in 1941. 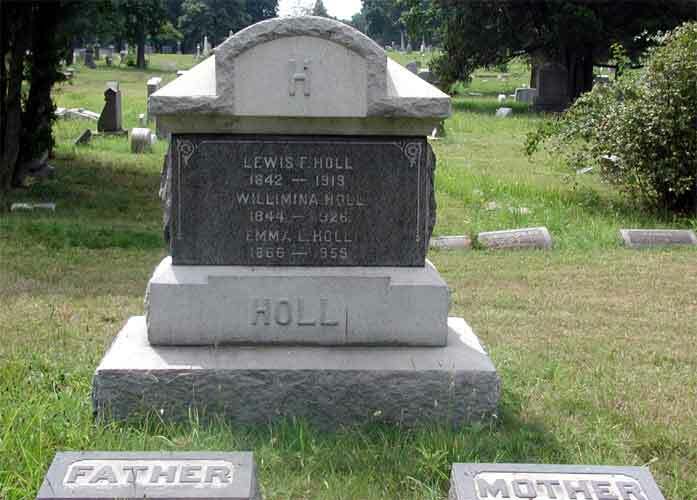 Lewis Holl died on December 16, 1919. He was survived by his son, Arthur Holl, and his wife Wilhelmina. Lewis Holl's brother-in-laws, G. Rudolph Tenner, George Adam Tenner, and Christian Tenner all served as members of the Camden Fire Department. George Adam Tenner and Christian Tenner also served as policemen in Camden. 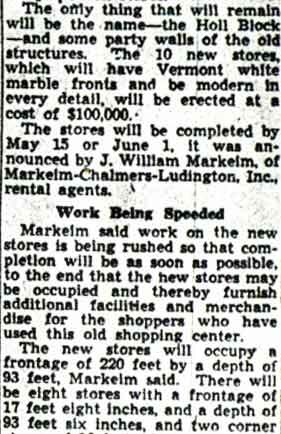 In 1942 the Holl block was demolished, and ten one-story stores were built which remain in use as of April of 2003. George and Lewis F. Holl built many houses and commercial buildings in Camden in the late 19th and early 20th centuries. The 1887-1888 directory for Camden shows George Holl at the corner of Broadway and Benson Street, and the directory for 1888-1889 has him at 310 Broadway. Lewis Holl lived with his wife Emma L. Holl at 328 Mount Vernon Street, Emma Holl also worked as a teacher. During this time the Holl brothers erected 12 three story business properties on the east side of Broadway between Mickle and Stevens Streets. 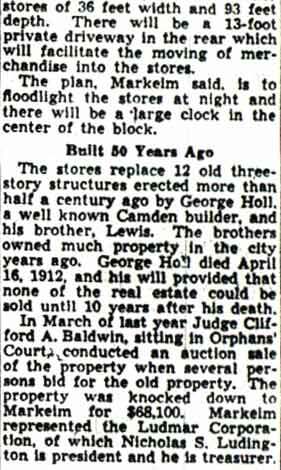 George Holl passed away on April 16, 1912, and Lewis on December 18, 1919. The brothers were buried in adjoining plots at Evergreen Cemetery in Camden. The properties on Broadway remained in the family for a time, but eventually found their way into Orphans Court, and were sold at auction in 1941. 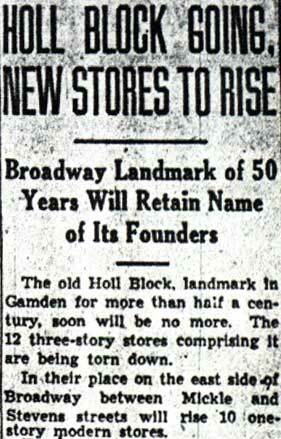 In 1942 the Holl block was demolished, and 10 one story stores were built which remain in use as of April of 2003.